Every human being & other living things have their own Aura, a field of energy that surrounds people & other living things, reflects the energy of the spirit in that body, this energy extends about two to four inches around the body & a light or pastel shade. It contains every color & shade in the rainbow & usually extends 2-5 inches from the body. Its colors textures & patterns reveal much information about emotional, mental physical, spiritual, karmic, environmental & relational states. An Aura is like a thumb print, it is completely individual & expresses who you really are in all your splendor. Rudraksh Bead have Electromagnetic, Paramagnetic, Diamagnetic and Dynamic Polarity or the ability to change its polarity. Rudraksh also have Anti Ageing Properties based on their Electromagnetism. When Rudraksha Beads are worn they interface and integrate with the Human Body at a silent subtle level of Consciousness. Due to their Dielectric and Magnetic Properties the Rudraksha Beads initiate and effect positive change in the Bio Electrical System of the Human Body in a life supporting manner. As a result of this change in the electrical makeup of our body, positive change is also initiated in our Bio Chemical System. There are no compulsions to wear a specific bead of Rudraksh as one can wear the combination of all beads and One can also wear a pendant of any specific facet of beads or a mix of different facet of beads as rudraksh do not have any negative effects unlike Gems , which can cause a greater level of harm if wrongly. Human body is basically a Bio Electronic circuit, blood circulation, the transmission of various impulses and the continuous movement of Neurons and Neurotransmitters in the brain generates electrical impulses which is know as Bioelectricity. It is believed and proved that Rudraksh beads have certain Electromagnetic and Inductive properties and when worn over the heart they send out corresponding signals differing for different mukhis to the brain, activating or controlling certain brain chemicals and neurotransmitters thereby inducing states of mind as described in ancient scriptures. For example the mental agitation's and Dopamine levels (Increased amount of Dopamine cause over activity of neurons resulting in mental agitation, restlessness, tension, fear lack of control etc. conversely decreased levels of Dopamine, result in peace, tranquility, stability etc.) of those who wore 5 mukhi Rudraksh was found to be less and the serotinin levels (low levels of Serotinin, one such neurotransmitter cause depression, worry, lack of energy, low self esteem and higher levels of it causes happiness, energy, drive, high levels of confidence and self esteem etc. )of those who wore 1 mukhi and12 mukhi Rudraksh bead was found to be high. The activity of neurons in the right part of the brain was found to be high in the wearer of 14 mukhi Rudraksh bead (right part of the brain control abstract and lateral thinking as against logical and structure thinking of left part of brain). This perhaps is the reason behind the change in personality and attitudes of the wearer of different types of Rudraksh beads. When the persons gets a positive confident frame of mind the impact goes deep into his subconscious mind sending out powerful vibrations there by changing the way nature and others react to him/her. 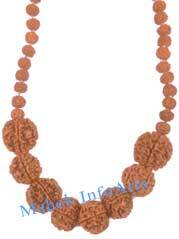 Rudraksha beads act as a Stabilizing newscaster, which can control the bio electronic circuit of our body. Rudraksha beads also have Paramagnetic and Diamagnetic properties with the most important property of Dynamic Polarity. Rudraksh beads have the properties of Magnets but it is unparallel in one aspect, that of the ability to change it's polarity or the Property of Dynamic Polarity. Medically it has been proved that Rudraksh has very powerful Anti Ageing properties because of the Dynamic Polarity of the Rudraksha a bead thus the healing powers of Rudraksha are far superior to that of Magnets. 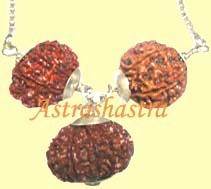 In some sense Rudraksha beads can be termed to have some additional life or Intelligence as against Magnets.